· Ventricular complexes: Premature impulses originating from the ventricles that occur earlier than the next expected normal sinus impulse are called premature ventricular complexes (PVCs) (Fig. 21.1). o PVCs are not preceded by P waves. o They are wide measuring ≥0.12 seconds because they originate from the ventricles below the bifurcation of the bundle of His. The impulse does not follow the normal intraventricular conduction system and is conducted from one ventricle to the other by direct muscle cell to muscle cell transmission. o The ST segment and T waves are opposite in direction (discordant) to the QRS complex. o The QRS complex is followed by a pause that is usually fully compensatory. · PVCs are often called ventricular extrasystoles. They occur very frequently in individuals with normal or abnormal hearts and are one of the most commonly encountered complexes in electrocardiography. · PVCs can be unifocal or multifocal. o Unifocal: Premature ventricular impulses that originate from a single location in the ventricle are unifocal PVCs. The PVCs are uniform and have identical configuration (Fig. 21.2). o Multifocal: Ventricular complexes that originate from two or more locations in the ventricle are multifocal PVCs. These PVCs have different configurations (Fig. 21.3). · Interpolated PVC: The PVC is interpolated when it is inserted between two sinus impulses without altering the basic sinus rate. An interpolated PVC is not followed by a pause (Fig. 21.4). · The PVC may or may not be followed by a fully compensatory pause. o Fully compensatory pause: The pause after a PVC is usually fully compensatory because the PVC does not discharge the sinus node prematurely; thus, the regularity of the sinus impulse is not interrupted (Fig. 21.5). The presence of a fully compensatory pause often differentiates a PVC from a premature atrial complex. o Less than fully compensatory pause: The pause after a PVC may be less than fully compensatory if the PVC is conducted retrogradely to the atria (ventriculoatrial conduction;Fig. 21.6) and discharges the sinus node prematurely. Because the sinus node is discharged earlier, its rate is reset causing the pause to be less than fully compensatory. The impulse may often suppress the sinus node, which may result in a much longer than fully compensatory pause. Figure 21.2: Unifocal Premature Ventricular Complexes (PVCs). The two PVCs noted in the rhythm strip, marked by stars, are identical in configuration and are unifocal in origin. Note also that the pause following the PVC is fully compensatory, meaning that distance A, which straddles the PVC, measures the same as distance B, which straddles a normal sinus impulse. ms, milliseconds. Figure 21.3: Multifocal Premature Ventricular Complexes (PVCs). The PVCs marked by the stars have different configurations and are multiformed. These PVCs originate from different locations in the ventricles and are multifocal in origin. Figure 21.4: Interpolated Premature Ventricular Complex (PVC). The PVC (star) is interpolated if it is sandwiched between two sinus complexes and is not followed by a pause. Note that the basic rate is not altered by the PVC (distance A, which represents the basic sinus rate is the same as distance B, which straddles a PVC). ms, milliseconds. Figure 21.5: Fully Compensatory Pause. Rhythm strip shows a premature ventricular complex (PVC) with a fully compensatory pause. The pause after a PVC is fully compensatory if the PVC does not reset the sinus node; thus, distance A, which straddles a PVC, measures the same as distance B, which straddles a normal sinus impulse. · Ventriculoatrial conduction: The ventricular impulse may conduct retrogradely across the atrioventricular (AV) node to activate the atria (Fig. 21.6). Although retrograde conduction to the atria may occur after a PVC, the retrograde P waves are not always visible because they are buried within the ST-T complex. · R on T phenomenon: This refers to an early PVC striking the terminal portion of the T wave of the previous complex (Fig. 21.7). A PVC manifesting the R on T phenomenon has a short coupling interval. · End-diastolic PVC: The PVC is end-diastolic if it occurs very late in diastole, so late that the next sinus P wave is already inscribed (Fig. 21.8). This usually results in a fusion complex. An end-diastolic PVC has a long coupling interval. · Coupling interval: The coupling interval is the distance between the PVC and the preceding QRS complex. The coupling interval of most PVCs is usually constant. End-diastolic PVCs have long coupling intervals because they occur very late during diastole after the sinus P wave is inscribed (Fig. 21.8). Conversely, PVCs manifesting the R on T phenomenon have short coupling intervals, usually measuring ≤0.40 seconds. Because the coupling interval is short, the PVCs occur at the downslope of the T wave of the previous complex (Fig. 21.7), which corresponds to the vulnerable period of the ventricles. This may potentially trigger a ventricular arrhythmia. · PVCs can occur as single beats but can be repetitive, occurring in bigeminy, trigeminy, quadrigeminy, etc. o PVCs in bigeminy: PVCs are bigeminal if every other complex is a PVC (Fig. 21.9). o PVCs in trigeminy: PVCs are trigeminal if every third complex is a PVC (Fig. 21.10). It is also trigeminal if there are two consecutive PVCs and the third complex is a sinus impulse (Fig. 21.11). o PVCs in quadrigeminy: The PVCs are quadrigeminal if every fourth complex is a PVC (Fig. 21.12). o Paired PVCs: PVCs occur in pairs or in couplets when two PVCs occur consecutively (Fig. 21.11). · PVCs may originate from the right ventricle or left ventricle. The electrocardiogram (ECG) is helpful in differentiating one from the other. Figure 21.6: Less Than Fully Compensatory Pause. Rhythmstrip shows two premature ventricular complexes (PVCs) with retrograde conduction to the atria. When this occurs, the PVC may reset the sinus node. Note that the distance between two sinus impulses straddling a PVC (distance A) is shorter than the distance between two impulses straddling a sinus impulse (distance B). ms, milliseconds. Figure 21.7: R on T Phenomenon. The premature ventricular complexes (PVCs) occur early, hitting the T wave of the previous complex. These PVCs have short coupling intervals of ≤0.40 seconds. The down slope of the T wave corresponds to the vulnerable period of the ventricle when the ventricular myocytes are in the process of repolarization. This can result in reentry within the ventricles when a stimulus like a PVC occurs. o Right ventricular apex: The PVC has LBBB configuration and the axis in the frontal plane is deviated to the left (Fig. 21.14). Figure 21.8: End-Diastolic Premature Ventricular Complex (PVC). The PVC is end-diastolic when it occurs very late, after the sinus P wave has been inscribed. 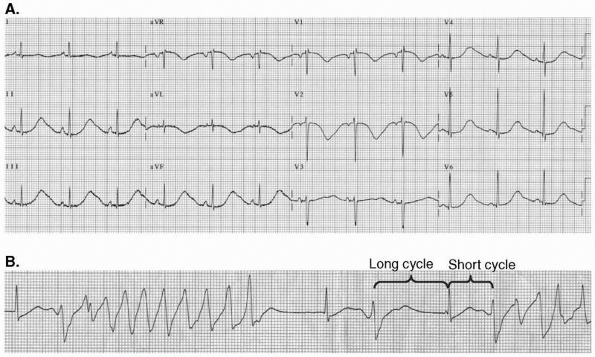 Figure 21.9: Premature Ventricular Complexes (PVCs) in Bigeminy. The PVCs alternate with normal sinus complexes. 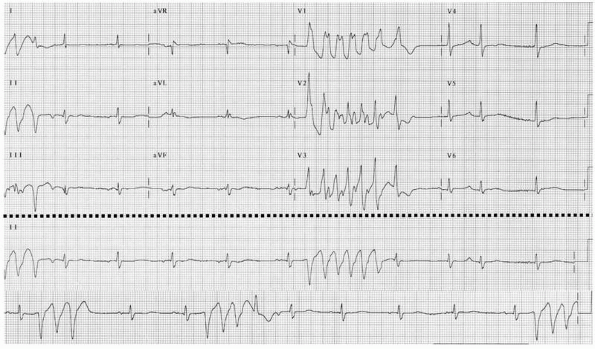 Figure 21.10: Premature Ventricular Complexes (PVCs) in Trigeminy. There are two sinus complexes and the third complex is a PVC. Figure 21.11: Trigeminy, also Ventricular Couplets or Paired Premature Ventricular Complexes (PVCs). One sinus complex and two consecutive PVCs also constitute trigeminy. These PVCs can also be described as occurring in pairs or in couplets. 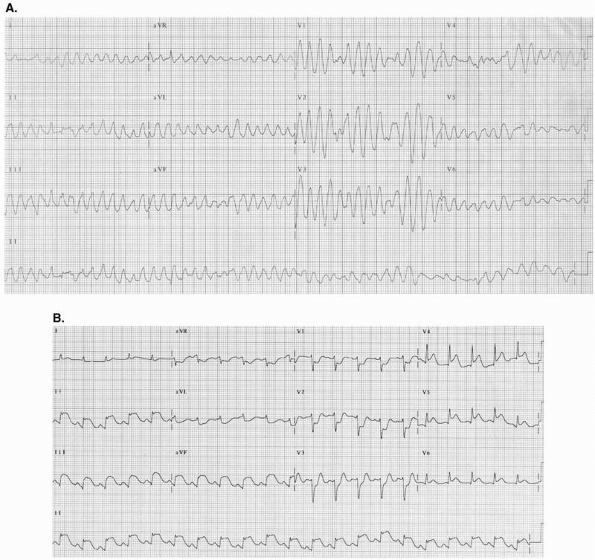 Figure 21.12: Premature Ventricular Complexes (PVCs) in Quadrigeminy. Every fourth complex is a PVC. Figure 21.13: Localizing the Origin of the Premature Ventricular Complex (PVC). See text for explanation. LAD, left axis deviation; LBBB, left bundle branch block; RAD, right axis deviation; RBBB, right bundle branch block. *When the PVC has a normal axis, the PVC could originate from the right ventricular inflow or the area between the right ventricular apex and right ventricular outflow. Figure 21.14: Premature Ventricular Complexes (PVCs) of Right Ventricular Origin. PVCs originating from the right ventricular apex have left bundle branch block (LBBB) configuration (rS complex in V1 and tall R in V6) with left axis deviation. The pattern is very similar to a pacemaker induced ventricular rhythm with the endocardial electrode positioned at the apex of the right ventricle. Figure 21.15: Premature Ventricular Complexes (PVCs) Originating from the Right Ventricular Outflow. The PVCs have left bundle branch block (LBBB) configuration with rS in V1 and tall R waves in V6. There is right axis deviation of the PVC in the frontal plane. These PVCs originate below the pulmonic valve in the right ventricular outflow area. o Right ventricular outflow: The PVC has a LBBB configuration and the axis in the frontal plane is deviated to the right (Fig. 21.15). o Right ventricular inflow: The PVC has LBBB configuration and the axis of the PVC in the frontal plane is normal. A PVC with this configuration can originate from the right ventricular inflow (tricuspid area), although it could also originate from the area between the right ventricular apex and right ventricular outflow (Fig. 21.16). Figure 21.16: Premature Ventricular Complexes (PVCs) from Right Ventricular Inflow. PVCs from right ventricular inflow (tricuspid area) have left bundle branch block (LBBB) configuration with rS complex in V1 and tall R in V6. The axis of the PVC is normal in the frontal plane. This type of PVC may also originate between right ventricular apex and right ventricular outflow. o Anterosuperior area: This area is supplied by the left anterior fascicular branch of the left bundle branch. The PVC has a RBBB configuration and the axis is deviated to the right (Fig. 21.17). o Inferoposterior area: This area is supplied by the left posterior fascicular branch of the left bundle branch. The PVC has a RBBB configuration and the axis is deviated to the left (Fig. 21.18). · Figure 21.14 shows PVCs originating from right ventricular apex; Figure 21.15 shows PVCs originating from the right ventricular outflow. Figure 21.17: Premature Ventricular Complexes (PVCs) from Left Ventricle. PVCs originating from the left ventricle in the area supplied by the left anterior fascicle have right bundle branch block (RBBB) configuration and right axis deviation. · Parasystole: Parasystole refers to an independent ectopic impulse that competes with the sinus node as the pacemaker of the heart. This ectopic impulse may be located in the atria, AV junction, or ventricles. The most commonly recognized location of a parasystole is in the ventricles. · Ventricular parasystole: Regular automatic cells from the AV junction and ventricles can not discharge independently because they are constantly depolarized and reset by the propagated sinus impulse. These automatic cells serve as backup pacemakers and become manifest only when the sinus node fails. Parasystole is different in that the cells are protected and cannot be discharged or reset by the sinus impulse. The parasystolic focus therefore can compete independently with the sinus impulse for control of the ventricles. The ventricular parasystole may or may not be able to capture the ventricles depending on the state of refractoriness of the ventricles. Thus, when the ventricles are not refractory from the previous sinus impulse, the parasystole may be able to capture the ventricles. Similarly, when the ventricles are still refractory from the previous impulse, the parasystole will not be able to capture the ventricles. Additionally, the sinus impulse and the ventricular parasystole may be able to capture the ventricles simultaneously resulting in fusion beats. · A premature ventricular impulse is therefore considered parasystolic when all of the following features are present (Fig. 21.19). o The coupling intervals of the ventricular complexes are variable. o Fusion complexes are present. o The ventricular complexes are mathematically related. Because the parasystolic focus is firing continuously, the longer interectopic intervals are multiples of the shorter interectopic intervals. Figure 21.18: Premature Ventricular Complexes (PVCs) from the Left Ventricle. PVCs originating from the left ventricle in the area supplied by the left posterior fascicle have right bundle branch block (RBBB) configuration and left axis deviation. Figure 21.19: Ventricular Parasystole. The rhythm is normal sinus interrupted by ectopic ventricular complexes with coupling intervals that vary from 460 to 760 milliseconds. The intervals between the ectopic ventricular complexes are constant measuring 1,640 milliseconds. The first ventricular complex marked by a star is a fusion complex. The presence of variable coupling intervals, fusion complex, and the constant intervals between the ectopic ventricular complexes suggest that the ventricular impulse is parasystolic. · Classification of ventricular arrhythmias: According to the American College of Cardiology/American Heart Association/European Society of Cardiology (ACC/AHA/ESC) 2006 guidelines, ventricular arrhythmias can be classified according to clinical presentation, ECG presentation, and disease entity. § Sudden cardiac death (death from unexpected circulatory arrest occurring within an hour after onset of symptoms). § Sudden cardiac arrest (death from unexpected circulatory arrest usually from cardiac arrhythmia occurring within an hour after onset of symptoms in which medical intervention such as defibrillation reverses the event). · Disease entity: The clinical and disease entities in which ventricular arrhythmias may occur include coronary disease, heart failure, congenital heart disease, neurological disorders, structurally normal hearts, sudden infant death syndrome, and cardiomyopathies (dilated, hypertrophic, and arrhythmogenic right ventricular cardiomyopathy). Figure 21.20: Ventricular Parasystole. The rhythm is normal sinus. Parasystolic impulses compete with the sinus rhythm resulting in ventricular complexes (arrows)with variable coupling intervals (dotted brackets). Fusion complexes (marked by stars) are also present. The last parasystolic impulse occurred during the refractory period of the ventricles and was not captured (last arrow). 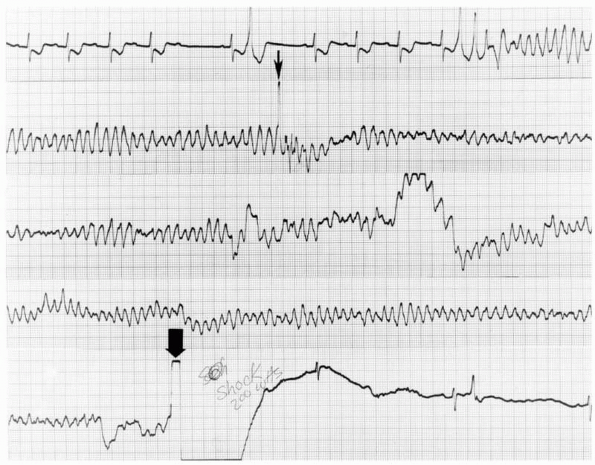 Figure 21.21: Nonsustained Monomorphic Ventricular Tachycardia (VT). Three or more consecutive premature ventricular complexes (PVCs) with a rate of >100 complexes per minute is VT. The VT is monomorphic because the ventricular complexes have the same configuration. The VT is nonsustained because the duration of the tachycardia is <30 seconds. · VT: Three PVCs in a row is a triplet. Three or more consecutive PVCs with a rate that exceeds 100 beats per minute (bpm) is VT. VT can be classified as sustained or nonsustained, monomorphic or polymorphic. o Nonsustained VT: VT is nonsustained if the tachycardia terminates spontaneously within 30 seconds (Fig. 21.21). o Sustained VT: VT is sustained if the tachycardia lasts more than 30 seconds (Fig. 21.22). It is also sustained if the tachycardia is associated with hemodynamic compromise, such as dizziness, hypotension, or near syncope, even if the duration of the VT is <30 seconds. o Monomorphic VT: VT is monomorphic if the ventricular complexes have a single or uniform configuration and may be nonsustained (Fig. 21.21) or sustained (Fig. 21.22). o Polymorphic VT: VT is polymorphic if the QRS complexes are multiformed or have different configurations and may be nonsustained (Fig. 21.24) or sustained (Fig. 21.25 andFigs. 21.27,21.28). · Bundle branch reentrant tachycardia: This type of VT is due to reentry. The pathway usually involves the left bundle branch, bundle of His, right bundle branch, ventricular septum, and back to the left bundle branch and left ventricle. During tachycardia, the right ventricle is activated anterogradely through the right bundle branch and the left ventricle through the ventricular septum. Thus, the QRS complexes are wide measuring ≥0.14 seconds with a LBBB pattern. During normal sinus rhythm, the baseline ECG usually shows evidence of His-Purkinje system disease with complete or incomplete LBBB often with a slightly prolonged PR interval. This type of VT should be identified because if sustained and recurrent, the VT may respond to radiofrequency ablation. Figure 21.22: Sustained Monomorphic Ventricular Tachycardia (VT). The VT is monomorphic because the QRS complexes are uniform. VT is sustained if the duration is >30 seconds or the tachycardia is associated with hemodynamic symptoms of hypotension, dizziness or near syncope even if the tachycardia terminates spontaneously within 30 seconds. Figure 21.23: Bidirectional Ventricular Tachycardia. The QRS complexes have right bundle branch block (RBBB) configuration with tall R waves in V1. The axis of the QRS complex in the frontal leads alternates from left axis to right axis indicating that the origin of the tachycardia alternates between left anterior and left posterior fascicles. Figure 21.24: Polymorphic Ventricular Tachycardia (PVT). Twelve-lead electrocardiogram showing nonsustained PVT. The rate of the PVT is very rapid and irregular and the QRS complexes have varying morphologies. The QTc is >0.46 seconds and is prolonged. When the QTc is prolonged, the PVT is called torsades de pointes. Lead II rhythm strips are recorded at the bottom of the tracing. Figure 21.25: Polymorphic Ventricular Tachycardia (PVT). (A) Twelve-lead electrocardiogram (ECG) showing PVT. The QRS complexes have different sizes and shapes and the rate is very rapid and irregular at almost 300 beats per minute. (B) The ECG immediately after successful cardioversion showed acute inferior myocardial infarction with a QTc of <0.44 seconds. Figure 21.26: Torsades de Pointes. Electrocardiogram (ECG) (A): Baseline 12-lead ECG showing unusually prolonged QTc of >0.70 seconds. Rhythm strip (B) is from the same patient showing nonsustained torsades de pointes. There are pauses (long cycles) on termination of the tachycardia. These pauses prolong the QT interval of the next complex. The compensatory pauses of single PVCs also result in long cycles, which also prolong the QTc of the next complex and facilitates the onset of torsades de pointes. Figure 21.28: Polymorphic Ventricular Tachycardia. The ventricular tachycardia starts with the fourth complex and continues to the end of the rhythm strip. Note that the rate of the tachycardia is unusually rapid and the ventricular complexes are polymorphic with some complexes pointing downward and other complexes pointing upward as shown by the arrows. Figure 21.29: Polymorphic Ventricular Tachycardia (PVT). Continuous rhythm strip showing sustained PVT deteriorating to ventricular fibrillation terminated by DC shock of 200 joules. The small arrow at the second rhythm strip is a precordial thump that was not successful in terminating the tachycardia. · Bidirectional tachycardia: In bidirectional tachycardia, the VT originates from two separate locations, the left anterior and left posterior fascicles of the left ventricle. Thus, the VT has RBBB configuration and the axis of the ectopic impulse alternates between right and left axis in the frontal plane (Fig. 21.23). When the ectopic impulse originates from the left anterior fascicle, the QRS complex is deviated to the right. When the ectopic impulse originates from the left posterior fascicle, the QRS complex is deviated to the left (see origin of PVCs, Fig. 21.13). This type of VT is frequently associated with digitalis toxicity. Figure 21.30: Ventricular Flutter. The QRS complexes are wide and uniform with a rate of approximately 300 beats per minute. The QRS complexes are monomorphic and there are no isoelectric intervals between the QRS complexes. Ventricular flutter is similar to monomorphic ventricular tachycardia (VT) except for the higher heart rate and has the same clinical significance. · Polymorphic VT: Polymorphic VT or PVT refers to a wide complex tachycardia with varying morphology of the QRS complexes (Fig. 21.24). The tachycardia is very unique in that the QRS complexes keep changing in size, shape, and direction. The rate of the tachycardia is usually rapid and irregular causing the patient to become hemodynamically unstable even when the VT is only of short duration. The configuration of the QRS complex may fluctuate and appear upright and then twists itself to become inverted with an isoelectric transition point, thus resembling a “spindle and node.” The PVT may occur in short bursts and may be self-terminating. If the arrhythmia becomes sustained (>30 seconds), the tachycardia may degenerate to ventricular fibrillation and can cause sudden death. Figure 21.31: Ventricular Fibrillation. In ventricular fibrillation, the rhythm is very disorganized and ineffective with an undulating baseline. The QRS complexes are very irregular and are not well defined. This rhythm is fatal unless the patient is successfully resuscitated. · Torsades de pointes: PVT may or may not be associated with prolonged QT interval. When the PVT is associated with prolonged QT interval, the VT is called torsades de pointes. When the PVT is associated with normal QT interval, the VT is a regular form of PVT. Torsades de pointes should be differentiated from regular PVT because the treatment of torsades de pointes is different from that of regular PVT. · Regular PVT: The 12-lead ECG of a patient with sustained PVT is shown (Fig. 21.25A). The 12-lead ECG immediately after she was successfully cardioverted to normal sinus rhythm showed acute inferior myocardial infarction (Fig. 21.25B) with normal QTc of <0.44 seconds. · Torsades de pointes: The presence of prolonged QTc differentiates torsades de pointes from regular PVT. The QT interval is measured during normal sinus rhythm before or immediately on termination of the tachycardia. The QT interval should be corrected for heart rate because the QT interval measures longer with slower heart rates and shorter with faster heart rates. The QT interval corrected for heart rate is the QTc. The QTc is prolonged when it measures <0.44 seconds in men and >0.46 seconds in women and in children. Prolonged QTc should always be recognized because it predisposes to torsades de pointes even among patients without cardiac disease, which can be fatal. The step by step calculation of the QTc is shown in Chapter 2, Basic Electrocardiography. · Prolongation of the QTc may be inherited or it may be acquired. o Inherited prolongation of the QTc: These patients are usually young and have family history of sudden death, often occurring at a young age. In some patients with congenitally prolonged QTc, the QTc does not stay prolonged, but may vary. Thus, screening of asymptomatic patients with family history of prolonged QTc may not show QT prolongation in the initial ECG examination. Additionally, about a third of patients who are known carriers of long QT syndrome confirmed by genetic testing will not show QTc prolongation. The duration of the QTc parallels the risk of developing torsades de pointes and sudden death. A long QTc of ≥0.50 seconds in patients with congenitally prolonged QT syndrome is a marker of increased cardiovascular risk. Because the QT duration exhibits marked variability, the longest QTc measured at any time during follow-up of a patient with congenital long QT syndrome provides important prognostic information. o Acquired prolongation of the QTc: In normal individuals, QTc prolongation can occur during acute myocardial ischemia, electrolyte abnormalities (hypokalemia, hypocalcemia, and hypomagnesemia), use of antiarrhythmic agents (Class IA and Class III), antihistaminics, antifungals, antimicrobials, tricyclic antidepressants, and nutritional causes resulting from alcohol, liquid protein diet, anorexia, and starvation. A long list of agents that can cause prolonged QTc can be accessed through Web sites at www.torsades.org or www.qtdrugs.org. · During tachycardia, the QRS complexes of torsades de pointes and regular PVT are similar and are both polymorphic. During normal sinus rhythm, the QTc of torsades de pointes is prolonged, whereas the QTc of regular PVT is not. Torsades de pointes is pause dependent, occurring when there is bradycardia, which is known to prolong the QTc. The arrhythmia is frequently seen in the setting of long/short cycles as shown in Figure 21.26B. · PVT with or without prolongation of the QTc is a serious arrhythmia that can become sustained and can cause sudden death. Even when the tachycardia is short and self-terminating, it is associated with symptoms and is usually not tolerable because of the very rapid ventricular rate as shown in the examples (Figs. 21.28 and 21.29). · Ventricular flutter: Ventricular flutter is similar to monomorphic VT except for a higher heart rate of approximately 300 bpm. There is no isoelectric interval between the QRS complexes. Because of the unusually rapid ventricular rate, the arrhythmia is seldom tolerated (Fig. 21.30). Ventricular flutter and VT are treated similarly. · Ventricular fibrillation: Ventricular fibrillation is a disorganized ventricular rhythm with poorly defined QRS complexes. The baseline is undulating and the QRS complexes are very irregular with varying sizes and shapes (Fig. 21.31). Monomorphic and polymorphic VT and ventricular fibrillation are frequently seen in patients with cardiac disease and severe left ventricular dysfunction. It can also occur in patients with structurally normal hearts such as patients with prolonged QT syndrome or patients with the Brugada syndrome. 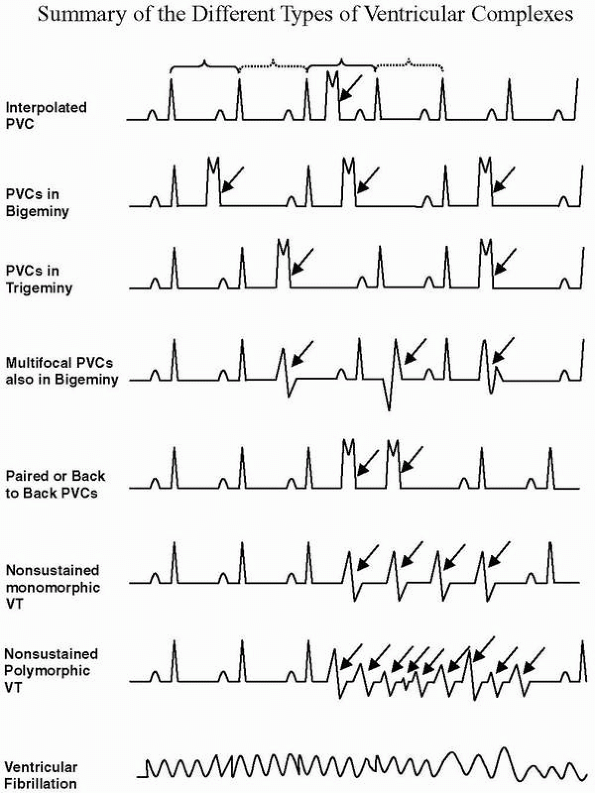 · Figure 21.32 summarizes diagrammatically the different ventricular arrhythmias. · A PVC is a premature complex that is wide with an ST segment and T wave that are opposite in direction to the QRS complex. This is followed by a pause that is fully compensatory. PVCs are often called ventricular extrasystoles with coupling intervals that are fixed. · A ventricular parasystole is a ventricular ectopic impulse that is protected. It is identified by the presence of fusion complexes, variable coupling intervals, and longer interectopic intervals that are mathematically related to the shorter interectopic intervals. · VT is present when three or more PVCs occur consecutively with a rate >100 bpm. VT can be sustained or nonsustained, monomorphic, or polymorphic. o The VT is nonsustained if the duration of the tachycardia is ≤30 seconds. o The VT is sustained if the duration is >30 seconds or if the tachycardia is associated with hemodynamic symptoms such as hypotension, dizziness, or syncope even if the tachycardia is self-terminating with a duration of ≤30 seconds. o VT is monomorphic if the QRS complexes are uniform in configuration. o VT is polymorphic if the QRS complexes have varying morphologies. § Torsades de pointes is a special form of polymorphic VT associated with prolonged QTc. § Regular polymorphic VT is similar to torsades de pointes except that the baseline QT interval is not prolonged. · Ventricular flutter has monomorphic ventricular complexes with a rate of approximately ≥250 bpm. The QRS complexes are not separated by isoelectric intervals. · Ventricular fibrillation has very disorganized rhythm with poorly defined QRS complexes with a rate of >300 bpm and is fatal if not emergently cardioverted. Figure 21.32: Ventricular Arrhythmias. Diagram shows examples of different ventricular arrhythmias. Arrows point to the ventricular ectopic complexes. · PVCs look different from normally conducted sinus impulses because PVCs originate from the ventricles below the bifurcation of the bundle of His. The impulse activates the ventricles sequentially by spreading from one ventricle to the other. This is in contrast to a supraventricular impulse, which originates above the bifurcation of the bundle of His, resulting in activation of both ventricles synchronously causing the QRS complexes to be narrow. · PVCs are commonly extrasystolic and are usually related to the preceding impulse most probably because of reentry of the impulse within the ventricles. Thus, the coupling intervals of extrasystoles are constant or fixed. · A ventricular parasystole is an independent pacemaker that is protected and is not depolarized by the propagated sinus impulse. It can therefore compete with the sinus node independently for control of the ventricles. Unlike ventricular extrasystoles, it bears no relationship to the preceding ventricular complex; thus, the coupling interval is not fixed. The impulse can capture the ventricles only when the ventricles are not refractory from the previous sinus impulse. Fusion beats are therefore present and the intervals between parasystolic impulses are mathematically related. · The origin of the ventricular impulse can be predicted by examining the morphology of the QRS complex in the 12-lead ECG. Briefly, ectopic ventricular complexes originating from the left ventricle will show positive or tall R waves in V1 (RBBB pattern) because the impulse has to travel from left ventricle to right ventricle toward lead V1. Ventricular complexes originating from the right ventricle will show negative or deep S waves in V1 (LBBB pattern) because the impulse has to travel from right ventricle to left ventricle away from V1. · VT both sustained and nonsustained may be due to enhanced automaticity of cells within the myocardium or His-Purkinje system. It could also be due to triggered activity, as in digitalis toxicity. It can also be due to reentry requiring the presence of two separate pathways with different electrophysiologic properties within the ventricles. · Repolarization of the millions of individual myocardial cells in the ventricles is not homogeneous because there are intrinsic differences in the action potential duration among the various cells composing the myocardium. This inhomogeneity or dispersion in ventricular repolarization will cause some cells to become excitable, whereas others continue to be refractory. This period may be extended when phase 3 is delayed or when there is prolongation of the action potential duration and QT interval. An ectopic impulse presented to the ventricles during this vulnerable period, which corresponds to the mid and terminal portion of phase 3 of the action potential, represented by the downslope of the T wave in the ECG (R on T phenomenon) may cause a reentrant tachycardia within the ventricles. Thus, QT dispersion >100 milliseconds, representing the difference between the longest and shortest QT interval in the 12-lead ECG, may be helpful in predicting those who are high risk for ventricular arrhythmias. · When acute myocardial ischemia and injury are present, the triggering impulse may not have to occur during the vulnerable phase of ventricular repolarization to cause ventricular arrhythmias because the presence of injured myocardium can further increase QT dispersion. Thus, in the setting of acute myocardial infarction, early and late PVCs are as likely to trigger VT.
· Simple PVCs: Single and frequent PVCs including multiformed complexes are commonly seen in patients with cardiac disease, although they are also present in healthy individuals with structurally normal hearts. In normal individuals, the frequency of ectopic ventricular complexes increases with increasing age. o During infancy: PVCs are rare during infancy. In a 24-hour Holter study of 134 healthy, full-term newborn infants, 19 had premature complexes, all supraventricular. o During childhood: Among healthy children, ages 7 to 11 years, 24-hour Holter monitor showed premature complexes only in 20 of 92 children. The premature complexes were supraventricular in 19 children and only 1 had a PVC. o Medical students: Among 50 healthy male medical students, 24-hour Holter study showed isolated PVCs in 25 (50%) and were multifocal in 6 (12%). One (2%) had couplets and another (2%) had nonsustained VT defined as three or more PVCs in a row with a rate >100 bpm. o Elderly population: Among 98 healthy elderly patients aged 60 to 85, 78 (80%) had ventricular arrhythmias. Ventricular couplets were present in 11 (11%) and nonsustained VT in 4 (4%). Multiformed PVCs were present in 34 (35%), 12 (12%) had ≥30 PVCs any hour, 7 (7%) have ≥60 PVCs any hour, and 17 (17%) had total of ≥100 PVCs in 24 hours. · Frequent and complex PVCs: Complex PVCs consisting of frequent multiformed ventricular complexes and nonsustained monomorphic VT are generally benign in completely asymptomatic individuals if there is no demonstrable cardiac disease and left ventricular systolic function is preserved. However, in patients with structural cardiac diseases, especially those with left ventricular dysfunction, these ventricular arrhythmias need further evaluation. o Healthy population: Long-term follow-up (3 to 9.5 years, mean 6.5 years) of 73 asymptomatic and healthy individuals, age 18 to 72 years, with frequent complex ventricular ectopy including those with nonsustained VT by 24-hour Holter (mean PVCs per hour 566, multiformed PVCs 63%, ventricular couplets 60%, nonsustained VT 26%), showed no increased mortality and a long-term prognosis similar to that of the general healthy population. o Patients with left ventricular dysfunction: Although these ventricular arrhythmias are not targets for pharmacologic therapy in the hospital or outpatient setting, patients with left ventricular dysfunction (ejection fraction of ≤40%) with frequent and complex ventricular ectopy should be referred for further evaluation because they may be at risk for more serious arrhythmias. · Ventricular parasystole: Ventricular arrhythmias that are known to be parasystolic are considered benign and require no therapy. A ventricular parasystole should always be suspected when the coupling intervals of the PVCs are not fixed. They are also recognized by fusion beats and the intervals between complexes are mathematically related. · The long QT syndrome: The QT interval is prolonged when the QTc measures >0.44 seconds (or >440 milliseconds) in men and >0.46 seconds (or >460 milliseconds) in women. A long QT interval predisposes to torsades de pointes, which is a special type of polymorphic VT. The following is a simplified review of the ionic changes that occur in the ventricular myocyte that can result in prolongation of the QT interval (see Chapter 1, Basic Anatomy and Electrophysiology). o Mechanism of the prolongation of the QT interval: During depolarization or phase 0 of the action potential, the fast sodium channels open briefly allowing sodium ions to enter the cell. The entry of positive ions into the cell causes the polarity of the cell to change abruptly from -90 to +10 to +20 mV. Depolarization is immediately followed by repolarization consisting of phases 1 through 3 of the action potential. This corresponds to the J point extending to the end of the T wave in the surface ECG. During phase 2, which corresponds to the plateau phase of the action potential, the polarity of the cell is maintained at approximately 0 mV for a sustained duration. This is due to entry of calcium into the cell because of activation of the slow or “L-type” calcium channels during depolarization. This slow but sustained flow of positive ions into the cell is counterbalanced by the flow of potassium out of the cell because the cell membrane is more permeable to potassium than other ions. This loss of potassium makes the inside of the cell more negative as positive ions are lost. Thus, the entry of calcium into the cell (entry of positive ions) combined with flow of potassium out of the cell (loss of positive ions) results in an equilibrium that is sustained for a prolonged duration corresponding to the plateau or phase 2 of the action potential. When the calcium channels are inactivated, the entry of calcium into the cell is suddenly prevented although the outward flow of potassium continues. This inequity in calcium entry and potassium outflow advances the action potential to phase 3. Phase 3 or rapid repolarization is due to continuous efflux of potassium from the cell causing the cell to become more negative until the resting potential of -90 mV is reached. This marks the end of phase 3 of the action potential, which corresponds to the end of the T wave in the surface ECG. o As long as the potential of the ventricular myocyte is prevented from reaching -90 mV, which is the normal resting potential, the cell is not fully repolarized. Thus, any mechanism that will prolong or increase the entry of sodium or calcium into the cell will make the inside of the cell more positive and will delay or prolong the duration of the action potential. Similarly, any mechanism that will inhibit or delay the exit of potassium out of the cell will make the cell less negative. This will also prolong the duration of the action potential. o Phases 0 through 3 of the transmembrane action potential correspond to the duration of the action potential of individual myocardial cells. This is equivalent to the QT interval in the surface ECG. Prolongation of phases 1 through 3 will result in prolongation of the QT interval. o Causes of prolonged QT interval: Prolongation of the QT interval may be acquired or it may be congenital. § Acquired long QT: In normal individuals with normal QTc, several pharmacologic agents can prolong the QT interval. These include type IA antiarrhythmic agents (quinidine, disopyramide, and procainamide), type III antiarrhythmic drugs (dofetilide, ibutilide, sotalol, and amiodarone), antipsychotic agents (chlorpromazine, thioridazine, and haloperidol), macrolide antibiotics (erythromycin, clarithromycin), antifungal agents (ketonazole and itraconazole), electrolyte disturbances notably hypomagnesemia and hypokalemia, and other agents such as pentamidine and methadone. A long list of pharmacologic agents that can prolong the QT interval can be accessed at www.torsades.org. Although the use of a single pharmacologic agent (quinidine or ibutilide) may cause QT prolongation and torsades de pointes almost immediately, occasionally, a combination of two agents may be needed to prolong the QT interval such as the concurrent use of erythromycin and ketonazole. Erythromycin, a macrolide antibiotic, and ketonazole, an antifungal agent, are both metabolized by the liver through the cytochrome P-450 3A4 (CYP 3A4) metabolic pathway. Either agent can potentially prolong the QT interval although prolongation of the QT interval is more significant when both agents are taken concurrently because they compete for the same metabolic pathway resulting in increased plasma concentration of both agents. Similarly, an agent that does not prolong the QT interval but depends on the CYP 3A4 metabolic pathway for clearance such as a calcium channel blocker (verapamil) when combined with a drug that prolongs the QT interval such as erythromycin can result in further prolongation of the QT interval since verapamil also depends on the same pathway as that of erythromycin for clearance. The effect on QT prolongation and potential for torsades de pointes may be more delayed, however. § Congenital long QT: Congenital or inherited prolongation of the QT interval affects young individuals especially the first 2 decades of life and is a common cause of sudden death in this age group. Two types of long QT syndrome have been clinically described. § The first familial long QT syndrome described by Jervell and Lange-Nielsen is associated with sensorineural deafness. This type of long QT syndrome is inherited as autosomal recessive. The second familial long QT syndrome is the Romano-Ward syndrome and is inherited as autosomal dominant but is not associated with congenital deafness. § With the advent of genetic testing, seven long QT syndromes have been described thus far and are labeled LQT1 to LQT7 according to the sequence in which the abnormal locus of the genetic defect have been discovered. The first three entities—LQT1, LQT2, and LQT3—are the most common and comprise almost 95% of all identified cases of congenital long QT syndromes. The prolongation of the QT is due to a genetic defect involving the potassium channel in most cases except LQT3 and LQT4, which are due to a defect in sodium transport. The genetic abnormality involves the ion channel in almost all cases except LQT4, which does not affect the ion channel directly, but only its supporting structure. § Patients with long QT syndrome can be confirmed by genetic testing, although a negative genetic test will not exclude the presence of congenital long QT syndrome because up to 40% of patients with congenital long QT have not been linked to any genetic abnormality. Additionally, the use of genetic testing remains very expensive and may not be affordable when screening several family members with history of long QT syndrome or known sudden death in the family. It also takes several weeks before the results are known. Thus, the diagnosis of long QT syndrome is more commonly based on phenotypic ECG abnormalities. § When the ECG is used in the diagnosis of patients with congenital long QT syndrome, marked variability in the duration of the QTc in serial ECGs can occur. Even in normal individuals, the QT interval can vary by as much as 50 to 75 milliseconds over a 24-hour period. Thus, screening of individuals with family history of long QT syndrome and sudden death may not show any initial QT prolongation. Additionally, almost a third of patients who are confirmed carriers have normal or borderline QTc of 0.40 to 0.46 seconds. The longest QTc, including those measured before age 10 years, provides important prognostic information during adolescence in patients with congenital long QT syndrome. Thus, a long QTc measuring ≥0.50 seconds identifies a patient who has increased risk of cardiovascular events and shorter QT intervals of <0.50 seconds decreases the risk of cardiovascular events. In these patients, however, there is no clear cut QT interval that is considered safe because QTc of ≤0.46 seconds are also at risk for syncope and sudden death. o LQT1: Long QT1 is the first mutation to be identified. It is one of the most common, accounting for approximately 50% of known long QT abnormalities. The abnormality involves the short arm of chromosome 11. The gene was identified using cloning techniques and was named KvLQT1 because it encodes a potassium channel, but was eventually renamed KCNQ1. Homozygous mutation of the gene causes the Jervell and Lange-Nielsen syndrome. The syndrome is associated with congenital deafness, which is also due to the abnormality in the same potassium channels involved with the production of potassium-rich endolymph in the inner ear. It is a much more common cause of sudden death younger than age 10 years when compared with the other long QT syndromes. Prolongation of the QT is due to delay in phase 3 of the action potential because of delay in the transport of potassium (α-subunit of the slow potassium rectifier or IKs). In addition to the prolonged QT, the T wave in the ECG has a slow indistinct onset, but is otherwise normal. Patients with LQT1 are most symptomatic during exertion because the QT interval becomes longer with exercise in contrast to patients with LQT3 who are most symptomatic during rest or sleep. The QT interval can be prolonged by intravenous injection of epinephrine. Thus, in symptomatic individuals, if the initial QT is not prolonged, the long QT can be unmasked with epinephrine. o LQT2: Long QT2 is also one of the most common long QT abnormalities with up to 40% of all congenital cases of long QT syndrome. The defect resides in chromosome 7 and the identified gene is called HERG (human ether agogo related gene) or KCNH2. Similar to LQT1, this gene is also involved with the potassium current. Unlike LQT1 that affects the slow potassium currents (called slow K rectifier or IKs), the gene is involved with the fast potassium currents (called rapid K rectifier or IKr), which is the most important in determining the duration of the action potential. Most pharmacologic agents that prolong the QT interval also inhibit the same potassium channel. In LQT2, the shape of the T wave in the ECG is bifid or split. Mutation of the HERG gene causes another abnormality characterized by an unusually short QT interval of ≤0.30 seconds called congenital short QT syndrome, which is also associated with sudden death. o LQT3: Unlike LQT1 and LQT2, which are involved with potassium transport, LQT3 involves mutation of the gene encoding a sodium channel. The abnormality is located in chromosome 3 and the gene is called SCN5A. LQT3 is less common than the first two long QT syndromes. The abnormality in the sodium channel causes prolongation of phase 2 of the action potential. This is due to delayed closure of the fast sodium channels on completion of rapid depolarization resulting in continuous entry of sodium ions into the cell, thus prolonging the duration of the action potential. The baseline ECG will show asymmetric T waves with a steep downslope. Most patients are symptomatic at rest or sleep, which causes the QT interval to prolong because of bradycardia. Mutation of the gene SCN5A has been implicated as the cause of the Brugada syndrome, where most of the arrhythmic events occur during sleep (see Brugada Syndrome). o LQT4: Long QT4 is the only other long QT syndrome associated with abnormality in sodium transport. It is the only long QT syndrome that is not a “channelopathy” because the abnormality does not directly involve an ion channel but its supporting structure. The abnormality resides in chromosome 4 and the gene is called ankyrin-B. The abnormality affects the sinus node and the clinical manifestations include symptoms of sinus node dysfunction. This is manifested as bradyarrhythmias as well as tachyarrhythmias including the tachycardia bradycardia syndrome. o LQT5: This abnormality involves mutation of gene KCNE1 in chromosome 21. The gene is also called minK. This type of long QT syndrome is rare. Homozygous mutation of this gene can also cause the Jervell and Lange-Nielsen syndrome. The abnormality involves the transport of potassium (β-subunit of the slow K rectifier or IKs) similar to LQT1. Prolongation of the action potential is due to delay in phase 3. The surface ECG usually shows T wave with a wide base. o LQT6: The abnormality also resides in chromosome 21 and involves the KCNE2 gene. This type of long QT syndrome is rare. The abnormality affects the rapid outward potassium transport (outward rapid K rectifier or IKr) resulting in decreased potassium efflux with prolongation of phase 3 of the action potential. The T wave has low amplitude. o LQT7: The abnormality resides in chromosome 17 and the gene involved is called KCNJ2. This abnormality prolongs the action potential duration through its effect on the inward rectifying currents involved with potassium transport, thus delaying phase 3. Both cardiac and skeletal muscle cells can be affected resulting in prolongation of the QT and hypokalemia induced periodic paralysis with a large U wave looking component in the ECG. This disorder is very rare and is often referred to as the Andersen syndrome. o Timothy syndrome often identified as LQT8: Timothy syndrome involves mutation of the L-type calcium channel. The defect involves chromosome 12 and the identified gene is CACNA1C. Calcium channel dysfunction causes multisystem involvement with osseous deformities including dysmorphic features and syndactyly in addition to autism, cognitive defects, and malignant ventricular arrhythmias. This very rare syndrome has also been referred to as LQT8. · Brugada syndrome: Another example in which malignant ventricular arrhythmias can occur in individuals with structurally normal hearts is the Brugada syndrome. Patients with this syndrome can be identified by the presence of a peculiar electrocardiographic pattern in baseline ECG characterized by RBBB with rSR′ configuration confined to V1 to V3. In V1 or V2, the J point and ST segment are elevated with a coved or upward convexity terminating into an inverted T wave (type I). In some patients, the elevated ST segment may assume a saddle back configuration (type II) or often a triangular pattern instead of a coved appearance (type III). Types II and III terminate in upright T waves. The ST elevation is confined to the right-sided precordial leads and is not accompanied by reciprocal ST depression. It may be permanent in some individuals, although, in others, it may vary from time to time. When these ECG changes are not present, the ST segment abnormalities can be unmasked by administration of sodium channel blocker such as procainamide, flecainide, or ajmaline. The QTc is not prolonged. Examples of the Brugada ECG are shown in Chapter 23, Acute Coronary Syndrome: ST Elevation Myocardial Infarction, differential diagnosis of ST segment elevation. Approximately 90% of patients with the Brugada ECG are males. o Mechanism: The abnormality has been identified to be a mutation in chromosome 3 involving gene SCN5A. Only the epicardial cells of the right ventricle are affected. These epicardial cells have abnormal sodium channels, which causes premature repolarization. The premature repolarization causes shortening of the duration of the action potential only of the abnormal cells. Repolarization of normal endocardial cells is not affected. The shortened duration of repolarization of the epicardial cells will cause these cells to repolarize earlier when compared with endocardial cells. Thus, during repolarization, a gradient between the abnormal epicardial and the normally repolarizing endocardial cells is created during phase 2 of the action potential resulting in elevation of the ST segment, only in the right precordial leads V1 to V3. This difference in repolarization between normal and abnormal cells can facilitate a reentrant arrhythmia. o This syndrome is a genetic defect without associated structural cardiac disease and can cause sudden death from polymorphic VT. Thus, the syndrome is primarily an electrical abnormality because it has no other clinical manifestations other than the ventricular arrhythmia. This clinical entity is endemic in Southeast Asia including Thailand, Japan, and the Philippines and affects mostly males in their mid to late 30s. The ECG abnormalities as well as the ventricular arrhythmias are enhanced by vagal activity; thus, the ventricular arrhythmias are commonly manifested during sleep. Because of its nocturnal frequency, it is often called sudden unexpected nocturnal death syndrome or SUNDS. Fever has also been shown to be a predisposing factor. The syndrome is inherited as autosomal dominant with variable expression similar to arrhythmogenic right ventricular cardiomyopathy. o In patients with the Brugada ECG who are symptomatic with syncope because of polymorphic VT or ventricular fibrillation, mortality is high. The incidence of VT and fibrillation is similar whether the patient is on a beta blocker, taking an antiarrhythmic agent (amiodarone) or the patient has an implanted automatic defibrillator. Only an implanted defibrillator is effective in preventing sudden death and therefore the only known effective therapy in reducing mortality. According to the ACC/AHA/ESC 2006 guidelines on ventricular arrhythmias, the implantable defibrillator receives Class I recommendation in patients with previous cardiac arrest and Class IIa recommendation in patients with history of syncope or documented VT. There are only few agents that are useful during an arrhythmic event. This includes isoproterenol, which receives a Class IIa recommendation and quinidine, a Class IIb recommendation. o Although symptomatic patients with the Brugada ECG are high risk for sudden death, the significance of the Brugada ECG in the general asymptomatic population is uncertain because not all patients with the Brugada ECG will develop VT or ventricular fibrillation. § Among 63 patients with the Brugada ECG reported by Brugada et al. in 1998, 41 were diagnosed after resuscitated cardiac arrest or syncope and 22 were asymptomatic, detected incidentally because of family history of sudden death. Of the 22 asymptomatic individuals, 6 (27%) developed ventricular arrhythmias during a mean follow-up of 27 months, whereas among the 41 symptomatic patients, 14 (34%) had a recurrence of the ventricular arrhythmia during a mean follow-up of 37 months. They concluded that asymptomatic patients with the Brugada ECG have the same risk of developing a cardiac arrhythmia when compared with patients who had previous history of aborted sudden death. § However, among 32 cases with the Brugada ECG detected in a population-based study of 4,788 asymptomatic Japanese individuals younger than 50 years of age who had biennial examinations and were followed for 41 years, there were 7 (26%) unexpected deaths in patients with the Brugada ECG compared with 20 (74%) in the control group. In most cases, the ECG finding was intermittent and was nine times higher in men than in women. § In another community-based study of 13,929 subjects also in Japan, the Brugada ECG was found in 98. There was one death during a follow-up of 2.6 years compared with 139 deaths among those without the Brugada ECG. The total mortality of patients with the Brugada ECG was not different from those without the abnormality. · Wolff-Parkinson-White (WPW) syndrome: The WPW syndrome is another clinical entity in which malignant ventricular arrhythmias can occur in the absence of structural cardiac disease that can result in sudden death. The ECG recognition, mechanism and the different arrhythmias associated with the syndrome, is further discussed in Chapter 20, Wolff-Parkinson-White Syndrome. · Ventricular fibrillation: The emergency treatment of patients with ventricular fibrillation is direct current electrical defibrillation. o Direct current defibrillation: Direct current unsynchronized shocks set at 360 joules if monophasic (or 200 joules if biphasic) should be delivered immediately. The ACC/AHA/ESC 2006 guidelines for management of ventricular arrhythmias, recommends that if the initial shock is unsuccessful, five cycles of cardiopulmonary resuscitation should be provided before delivering the second shock and if the second shock is also not effective, another five cycles of cardiopulmonary resuscitation is provided before delivering the third shock. The previous recommendation was to deliver three shocks in a row followed by cardiopulmonary resuscitation. o Cardiopulmonary resuscitation: If the patient has been in cardiac arrest for more than 5 minutes, a brief period of cardiopulmonary resuscitation is initially recommended before the patient is electrically defibrillated. § Epinephrine: If the arrhythmia is refractory to electrical defibrillation, epinephrine 1 mg is given IV and repeated every 3 to 5 minutes while providing continuous cardiopulmonary resuscitation. § Vasopressin: An alternative is to give vasopressin 40 U IV given once to substitute for the first or second dose of epinephrine. § Amiodarone: If ventricular fibrillation is refractory to electrical defibrillation, amiodarone is also given IV with a loading dose of 300 mg or 5 mg/kg and electrical defibrillation repeated. An additional dose of 150 mg of amiodarone may be given once only. Amiodarone is continued at 1.0 mg/minute for 6 hours followed by 0.5 mg/minute for the next 18 hours when the patient has stabilized. It is not necessary to give amiodarone routinely if the patient responds to the initial shock followed by a stable rhythm. § Electrolytes: After ventricular fibrillation is stabilized, all electrolyte and acid base abnormalities should be corrected. Serum potassium should be >4 mEq/L and magnesium >2.0 mg/dL. § Beta blockers: Beta blockers, unless contraindicated, should also be given as prophylactic therapy. o Other measures: There are conditions that may have precipitated or contributed to the arrhythmia. According to the ACC/AHA/ESC 2006 practice guidelines on ventricular arrhythmias, the contributing conditions include 6 Hs and 5 Ts. They are Hypovolemia, Hypoxia, Hydrogen ion (acidosis), Hypo- or hyperkalemia, Hypoglycemia, Hypothermia, Toxins, Tamponade, Tension pneumothorax, Thrombosis (coronary or pulmonary), and Trauma. These conditions should be identified and corrected. · Sustained monomorphic VT: The acute treatment of sustained monomorphic VT depends on whether or not the patient is hemodynamically stable. However, because electrical cardioversion is so effective in terminating monomorphic VT, cardioversion should be considered as initial therapy regardless of symptoms. Among stable patients with monomorphic VT, pharmacologic therapy can be an option. If the patient does not respond to the initial pharmacologic agent, the VT should be terminated with electrical cardioversion. o Hemodynamically unstable patients with sustained monomorphic VT: Unstable patients with monomorphic VT who are hypotensive (blood pressure <90 mm Hg), in pulmonary edema or have symptoms of myocardial ischemia from the tachycardia, the ACC/AHA/ESC 2006 guidelines for ventricular arrhythmias and the ACC/AHA guidelines for the management of ST elevation myocardial infarction recommend synchronized cardioversion with appropriate sedation starting at 100 joules of monophasic shock followed by escalating energy levels of 200 to 300 and finally 360 joules, if the initial shocks are unsuccessful. o Hemodynamically stable: In hemodynamically stable patients with sustained monomorphic VT, electrical cardioversion remains an option. Antiarrhythmic agents, however, may be considered instead of electrical cardioversion. The preferred antiarrhythmic agent will depend on the presence or absence of left ventricular systolic dysfunction. § Hemodynamically stable patients with preserved left ventricular function: The acute pharmacologic treatment of sustained VT for patients who are stable with good left ventricular systolic function includes procainamide, amiodarone, lidocaine, or sotalol. Only one antiarrhythmic agent should be given to minimize the proarrhythmic effect of multiple drugs. If the chosen antiarrhythmic agent is not effective, electrical cardioversion should be performed to terminate the VT.
§ Procainamide: The ACC/AHA/ESC 2006 guidelines for management of patients with ventricular arrhythmias recommend procainamide as the initial agent in patients with monomorphic VT who are hemodynamically stable with good left ventricular function. This agent receives a Class IIa recommendation. Procainamide is more effective than amiodarone in the early termination of stable monomorphic VT. The maximum loading dose of procainamide should not exceed 17 mg/kg. The loading dose is given as an intravenous infusion until the tachycardia is suppressed. The infusion should not exceed 50 mg/minute or a total loading dose of 1 g over 30 minutes. This is followed by a maintenance dose of 1 to 4 mg/minute. This drug is preferred among all other drugs in sustained monomorphic VT if the patient is stable and has preserved systolic function. It should not be given when there is systolic left ventricular dysfunction or there is evidence of heart failure. § Amiodarone: Amiodarone is one of the few agents that can be given to patients with good LV function or with LV dysfunction. Although amiodarone is the recommended antiarrhythmic agent (Class I) for stable patients with sustained monomorphic VT according to the ACC/AHA 2004 practice guidelines for ST elevation myocardial infarction, it is not as effective as procainamide for early termination of stable monomorphic VT according to the ACC/AHA/ESC 2006 guidelines for ventricular arrhythmias and receives a Class IIa recommendation when the VT is refractory to electrical cardioversion or if the VT is unstable or recurrent in spite of therapy with intravenous procainamide or other drugs. The dose of amiodarone is 150 mg IV given as a bolus within 10 minutes and may be repeated every 10 to 15 minutes as needed. This is followed by an IV infusion of 1 mg/minute for the next 6 hours and 0.5 mg/minute for the next 18 hours. The total intravenous dose should not exceed 2.2 g during the first 24 hours. § Lidocaine: If the monomorphic VT is known to be due to acute myocardial ischemia or a complication of acute myocardial infarction, lidocaine may be given as initial therapy. This agent receives a Class IIb recommendation according to the ACC/AHA/ESC 2006 practice guidelines for the management of patients with ventricular arrhythmias. Lidocaine is given IV at an initial bolus of 1 mg per kg body weight. The initial bolus should not exceed 100 mg. If the first bolus is unsuccessful, a second bolus of 0.5 to 0.75 mg/kg IV is given and a third and final bolus may be necessary. The total IV dose within the first 3 hours should not exceed 3 mg/kg body weight. The infusion is followed by a maintenance dose of 1 to 4 mg/minute. § Sotalol: This agent is not available in the United States as an IV preparation. Similar to procainamide, it should not be given when there is LV dysfunction. Dosing is discussed in the Appendix: Commonly Used Injectable Pharmacologic Agents. § Electrical cardioversion: Even among stable patients, electrical cardioversion may be considered as initial therapy instead of giving antiarrhythmic agents. If antiarrhythmic therapy was decided and was not effective, the patient should be electrically cardioverted. In stable patients, low monophasic energy settings starting at 50 joules can be given under adequate sedation. § Temporary pacing: Temporary pacing receives a Class IIa recommendation for overdrive suppression in patients refractory to cardioversion or in patients with recurrent VT in spite of antiarrhythmic therapy. § Hemodynamically stable patients with impaired left ventricular function: The acute therapy of patients with monomorphic VT who are hemodynamically stable but have systolic LV dysfunction (ejection fraction ≤40 % or evidence of congestive heart failure) is limited to amiodarone and lidocaine. Agents that can further depress systolic function such as sotalol and procainamide are proarrhythmic and negatively inotropic and should not be given. § Amiodarone: Dosing is the same as in patients with normal systolic function. § Lidocaine: Dosing is the same as in patients with normal systolic function. · Sustained polymorphic VT: Most patients with polymorphic VT are generally unstable because the VT has a rapid rate and electrical defibrillation is usually necessary unless the VT is self-terminating. The ACC/AHA guidelines on ST elevation myocardial infarction recommend 200 joules of monophasic shock under adequate sedation. This is followed by another shock of 200 to 300 joules if the initial shock is ineffective and a third shock of 360 joules if necessary. The more recent ACC/AHA/ESC 2006 guidelines for the management of ventricular arrhythmias suggest that any unsynchronized shock should be set to the maximum energy setting, which is 360 joules of monophasic shock, to minimize the risk of ventricular fibrillation with low level settings. After the tachycardia is terminated, pharmacologic therapy is also recommended. The type of pharmacologic agent will depend on whether the polymorphic VT is associated with normal QTc (regular polymorphic VT) or prolonged QTc (torsades de pointes). o Regular PVT: Regular PVT (normal QTc) is usually associated with myocardial ischemia and should be considered as the cause of the VT in all patients. § Reverse myocardial ischemia: Urgent coronary angiography, insertion of intraaortic balloon pump, and emergency myocardial revascularization should be considered as part of the overall treatment of regular polymorphic VT when there is ischemic heart disease. Anti-ischemic agents such as beta blockers should be given intravenously especially if the polymorphic VT is recurrent. § Antiarrhythmic agents: Therapy is similar to monomorphic VT and includes procainamide, amiodarone, lidocaine, or sotalol (see treatment of monomorphic VT). Dosing is similar to monomorphic VT. Intravenous amiodarone receives a Class I recommendation if the PVT is recurrent without QT prolongation. Lidocaine receives a Class IIb recommendation in patients with acute myocardial infarction or myocardial ischemia. o Torsades de pointes: Although the tachycardia of torsades de pointes and regular polymorphic VT look identical, treatment of these two arrhythmias are different because one is associated with prolonged QTc, whereas the other is not. In patients with torsades de pointes with acquired prolongation of the QT interval, the long QT interval is reversible and the cause should be identified and eliminated. This is in contrast to congenital long QT syndrome where prolongation of the QT may not be reversible. Nevertheless, in both congenital and acquired long QT syndrome, any identifiable cause of QT prolongation should be corrected. § Reverse myocardial ischemia: Myocardial ischemia can prolong the QTc and cause polymorphic VT and should be reversed with the use of anti-ischemic agents. In congenital prolonged QTc, the tachycardia is often induced by adrenergic stimulation. Thus, beta blockers are the agents of choice and should be included as baseline therapy in patients with torsades de pointes unless the drug is contraindicated. § Correct electrolyte abnormalities: Electrolyte abnormalities especially hypokalemia and hypomagnesemia can prolong the QT interval. If the potassium level is below 4.0 mEq/L, potassium repletion to 4.5 to 5.0 mEq/L should be considered. § Antiarrhythmic agents: In torsades de pointes, antiarrhythmic agents that prolong the QT interval such as Class IA and Class III agents are not only ineffective but may be fatal. The following are recommended for torsades de pointes. § Magnesium: This agent receives a Class IIb recommendation. It may not be effective if the QT is not prolonged. One to 2 g of magnesium is diluted with 50 to 100 mL D5W and given IV as a loading dose. The solution is injected within 1 hour (5 to 60 minutes). The infusion is given more rapidly for unstable patients. This is followed by 10 to 20 g within the next 24 hours, even in patients without hypomagnesemia. § Lidocaine: This antiarrhythmic agent does not prolong the QT interval. The dose of lidocaine is the same as for monomorphic VT.
§ Isoproterenol: This usually serves as a bridge before a temporary pacemaker can be inserted. This is usually effective as temporary treatment in patients with acquired long QT syndrome when there is significant bradycardia, AV block, or when there are pausedependent torsades de pointes. Because isoproterenol can cause tachycardia, it should not be given when the torsades de pointes are not pause dependent or the basic heart rate is not bradycardic. When the tachycardia is pause dependent, the VT can be prevented by increasing the heart rate resulting in overdrive suppression similar to that of an artificial pacemaker. The drug is given IV at 2 to 10 mcg/minute. The infusion is titrated according to the desired heart rate that can suppress the tachycardia. § Phenytoin: Phenytoin is given with a loading dose of 250 mg diluted in normal saline. The solution is infused IV over 10 minutes. Additional boluses of 100 mg are given every 5 minutes as necessary under constant blood pressure and ECG monitoring until a maximum dose of 1,000 mg is given. Dextrose should not be used as a diluent since crystallization can occur. The drug should not be given as a continuous IV infusion. § Temporary pacemaker: A temporary pacemaker is inserted transvenously for overdrive pacing. This is usually effective when torsades de pointes is pause dependent or the VT occur in the setting of bradycardia of <60 bpm. · The following (Table 21.1) is a summary of the recommended initial and subsequent shocks during electrical cardioversion in patients with sustained ventricular arrhythmias according to the 2004 ACC/AHA guidelines on ST elevation myocardial infarction. All shocks are monophasic. * The more recent American College of Cardiology/American Heart Association/European Society of Cardiology 2006 guidelines for management of ventricular arrhythmias recommend maximal defibrillator settings (360 joules of monophasic shock) if unsynchronized shock is delivered to minimize the risk of ventricular fibrillation with low settings. VT, ventricular tachycardia. · Ventricular fibrillation and sustained VT: Patients who have survived an episode of sustained VT or ventricular fibrillation are high risk for sudden death and should be referred to an electrophysiologist. These patients usually have structural cardiac disease with severe LV dysfunction. Any reversible condition that can cause arrhythmia such as electrolyte abnormalities, myocardial ischemia, severe blood gas abnormalities, or the use of agents that are proarrhythmic should be identified and corrected. Beta blockers and anticongestive agents that prolong survival in patients with left ventricular systolic dysfunction such as angiotensin-converting enzyme inhibitors, angiotensin receptor blockers, aldosterone antagonists, and, among African Americans, a hydralazine/nitrate combination should be given unless these drugs are contraindicated. In patients with poor LV systolic function, implantation of an automatic defibrillator for secondary prevention is recommended. In these patients, the use of antiarrhythmic agents does not match the efficacy of the automatic defibrillator in reducing mortality. · Nonsustained VT: Patients who are completely asymptomatic but have frequent multiformed PVCs with nonsustained monomorphic VT need to be referred for further cardiac evaluation. The arrhythmia is most probably benign in asymptomatic patients with structurally normal hearts. However, in patients with impaired LV function, especially those who have survived an acute myocardial infarction, the patient has to be referred for further evaluation and therapy. Similarly, in patients with PVT, even when nonsustained, treatment and further evaluation is warranted. Treatment of systolic dysfunction with beta blockers, angiotensin-converting enzyme inhibitors, or angiotensin receptor blockers and aldosterone antagonists should be considered in addition to correction of myocardial ischemia or other metabolic, electrolyte, and blood gas abnormalities that may be present. No antiarrhythmic therapy is necessary in asymptomatic patients with nonsustained VT who have been evaluated to have structurally normal hearts. · PVCs: PVCs from ventricular parasystole is considered a benign finding. Similarly, simple, benign ventricular extrasystoles are commonly seen in normal healthy individuals. These ectopic impulses may be associated with smoking; excessive coffee, tea, or alcohol; use of diet pills, sympathetic agents, thyroid hormones, diuretics; and medications for common colds or asthma, antipsychotic agents and electrolyte abnormalities. A previously asymptomatic and presumably healthy individual with a structurally normal heart who develops palpitations from simple, benign PVCs should be evaluated for these possible causes. Treatment is simply reassurance that the arrhythmia is benign and the possible cause eliminated. · Prognosis will depend on the type of ventricular arrhythmia and the underlying cardiac abnormality. o Sustained VT or ventricular fibrillation are serious and life-threatening arrhythmias. Most of these arrhythmias are frequently seen in patients with severe left ventricular dysfunction and has high mortality. Prognosis is improved with appropriate therapy. o Patients with structurally normal hearts who develop malignant ventricular arrhythmias are also at risk for sudden death. These include patients with prolonged QTc, Brugada syndrome, and arrhythmogenic right ventricular cardiomyopathy. Prognosis is improved with medical therapy. In properly selected patients, implantation of an automatic defibrillator may be indicated. o In the general population, VT or ventricular fibrillation can occur as a complication of acute myocardial infarction and is a common cause of sudden death. o PVCs that are parasystolic are considered benign. Although acute treatment of frequent parasystolic and extrasystolic PVCs and nonsustained VT is not indicated, long-term prognosis will depend on the presence or absence of cardiac disease. o PVT with or without QTc prolongation, even when self-terminating and of short duration, may incur an immediate risk of morbidity and mortality. The long-term prognosis will depend on the cause of the PVT and underlying cardiac abnormality. 2005 American Heart Association guidelines for cardiopulmonary resuscitation and emergency cardiovascular care. Part 7.3: management of symptomatic bradycardia and tachycardia.Circulation. 2005;112:67-77. Ackerman MJ. The long QT syndrome: ion channel diseases of the heart. Mayo Clin Proc. 1998;73:250-269. Antman EM, Anbe DT, Armstrong PW, et al. ACC/AHA guidelines for the management of patients with ST elevation myocardial infarction: executive summary: a report of the ACC/AHA Task Force on Practice Guidelines (Committee to Revise the 1999 Guidelines on the management of patients with acute myocardial infarction). J Am Coll Cardiol. 2004;44:671-719. Bigger JT Jr. Ventricular arrhythmias: classification and general principles of therapy. In: Horowitz LN, ed. Current Management of Arrhythmias. Philadelphia: BC Decker Inc; 1991:130-137. Brodsky M, Wu D, Denes P, et al. Arrhythmias documented by 24 hour continuous electrocardiographic monitoring in 50 male medical students without apparent heart disease. Am J Cardiol. 1977;39:390-395. Brugada J, Brugada R, Brugada P. Right bundle-branch block and ST-segment elevation in leads V1 through V3. A marker for sudden death in patients without demonstrable structural heart disease. Circulation. 1998;97:457-460. Castellanos Jr A, Ortiz JM, Pastis N, et al. The electrocardiogram in patients with pacemakers. Progr Cardiovasc Dis. 1970;13: 190-209. Conover MB. Monomorphic ventricular rhythms. In: Understanding Electrocardiography. 8th ed. St. Louis: CV Mosby Co.; 2003:151-170. Conover MB. Congenital long QT syndrome. In: Understanding Electrocardiography. 8th ed. St. Louis: CV Mosby Co.; 2003: 369-380. Fleg JL, Kennedy HL. Cardiac arrhythmias in a healthy elderly population: detection by 24-hour ambulatory electrocardiography. Chest. 1982;81:302-307. Goldenberg I, Mathew J, Moss AJ, et al. Corrected QT variability in serial electrocardiograms in long QT syndrome. The importance of the maximum corrected QT for risk stratification. J Am Coll Cardiol. 2006;48:1047-1052. Guidelines 2000 for cardiopulmonary resuscitation and emergency cardiovascular care, an international consensus on science. The American Heart Association in Collaboration with the International Liaison Committee on Resuscitation. 7D: the tachycardia algorithms. Circulation. 2000;102: I-158-I-165. Gussak I, Antzelevitch C, Bjerregaard P, et al. The Brugada syndrome: clinical, electrophysiologic and genetic aspects. J Am Coll Cardiol. 1999;33:5-15. Kennedy HL, Whitlock JA, Sprague MK, et al. Long-term follow-up of asymptomatic healthy subjects with frequent and complex ventricular ectopy. N Engl J Med. 1985;312:193-197. Locati ET. QT interval duration remains a major risk factor in long QT syndrome patients. J Am Coll Cardiol. 2006;48: 1053-1055. Matsuo K, Akahoshi M, Nakashima E, et al. The prevalence, incidence and prognostic value of the Brugada-type electrocardiogram. A population-based study. J Am Coll Cardiol.2001;38:765-770. Miyasaka Y, Tsuji H, Yamada K, et al. Prevalence and mortality of the Brugada-type electrocardiogram in one city in Japan. J Am Coll Cardiol. 2001;38:771-774. Moss AJ. Long QT syndrome. JAMA. 2003;289:2041-2044. Priori SG, Napolitano C, Gasparini M, et al. Natural history of Brugada syndrome. Insights for risk stratification and management. Circulation. 2002;105:1342-1347. Priori SG, Schwartz PJ, Napolitano C, et al. Risk stratification in the long-QT syndrome. N Engl J Med. 2003;348: 1866-1874. Southall DP, Johnston F, Shinebourne EA, et al. 24-hour electrocardiographic study of heart rate and rhythm patterns in population of healthy children. Br Heart J. 1981;45: 281-291. Southall DP, Richards J, Mitchell P, et al. Study of cardiac rhythm in healthy newborn infants. Br Heart J. 1980;43:14-20. Wellens HJJ, Conover M. Drug-induced arrhythmic emergencies. In: The ECG in Emergency Decision Making. 2nd edition. St. Louis: Saunders/Elsevier; 2006:177-186. Zimetbaum PJ, Josephson ME, Kwaku KF. Genetics of congenital and acquired long QT syndrome. 2007 UpToDate. Zipes DP, Camm AJ, Borggrefe M, et al. ACC/AHA/ESC 2006 guidelines for management of patients with ventricular arrhythmias and the prevention of sudden cardiac death: a report of the American College of Cardiology/American Heart Association Task Force and the European Society of Cardiology Committee for Practice Guidelines (Writing Committee to Develop Guidelines for management of patients with ventricular arrhythmias and the prevention of sudden cardiac death). J Am Coll Cardiol. 2006,48:e247-e346.